A simple restart solves many connectivity issues, so you should never have the need to do factory reset on your Linksys Velop. A factory reset restores your Velop to the state it was when you first took it out of the box, and requires you to go through the setup process again. QUICK TIP: To know how to restart your Velop network using the Linksys app, click here. NOTE: Before resetting the node, make sure that the node completely boots up showing a purple light or blue light (if the node has been previously setup). Attempting to factory reset the node immediately after power cycling will not work, you must wait for a purple or blue light to show up before factory resetting the node. All the settings that you have customized such as the Wi-Fi name, passwords, and security type will be erased. Follow the instructions below to reset a node. NOTE: A Parent node refers to the node that is physically connected to your modem. All other nodes in your Velop system are considered as Child nodes. Make sure that your Parent node is connected to a power source and turned ON. 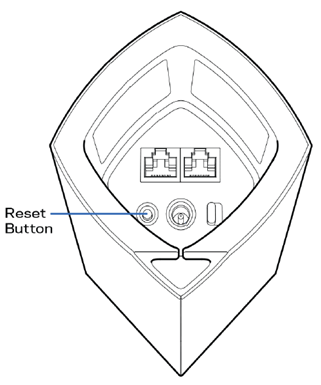 Press and hold the Reset Button at the bottom of the device for 6 seconds. The light on top of the Parent node will turn red and fade in three pulses. Do not release the button until the light goes out and then turns bright red. After you reset and reconfigure the Parent node, the Child nodes will no longer be part of your Velop network. You must also reset the rest of the other Child nodes and reconfigure them. To know how, click here. After adding other Child nodes into your Velop network, verify them by opening the Linksys app and checking the Velop Administration. All your Child nodes should appear in this page. NOTE: When resetting a Child node, you don’t need to reset the Parent node or any other node. Make sure that your Child node is connected to a power source and turned ON. Press and hold the Reset Button at the bottom of the device for 6 seconds. The light on top of the Child node will turn red and fade in three pulses. Do not release the button until the light goes out and then turns bright red. After you reset and reconfigure the Child node, you will need to add this Child node back into the Velop system. To know how, click here. 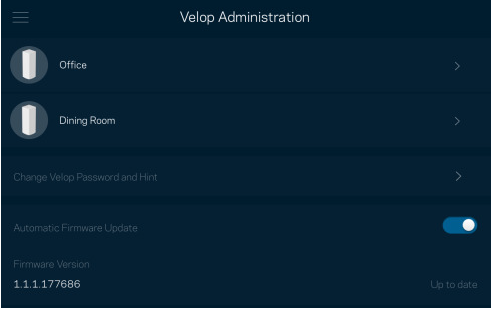 Once added, make sure that your Child node is already part of the Velop network by opening the Linksys app and checking the Velop Administration. Your Child node should appear in this page.